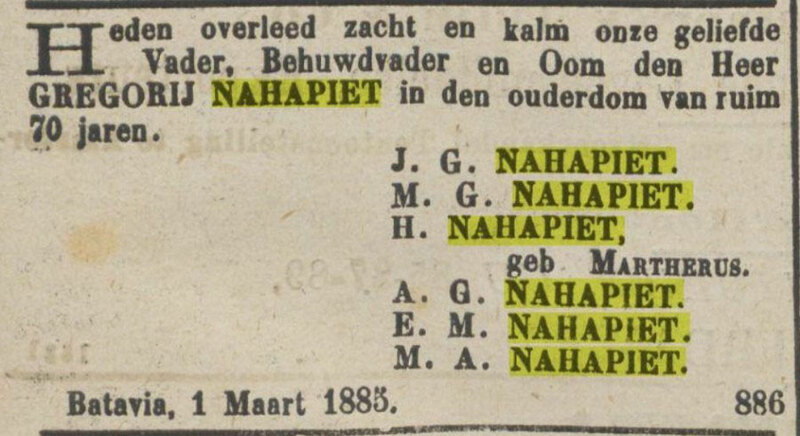 NAHAPETIAN family or according the Dutch almanacs: Gregory Nahapiet. 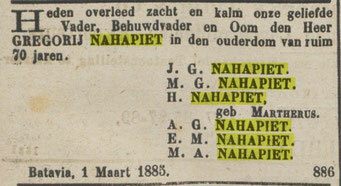 At Batavia on March 1, 1885 died: Gregory Nahapiet in the age of <70 years. Meaning that he was born on or about 1814. The ad was signed by the children and cousins : J.G., M.G. and wife H. Martherus, A.G., E.M. and M.A. The ad do not show the name of his (second)wife. !!! 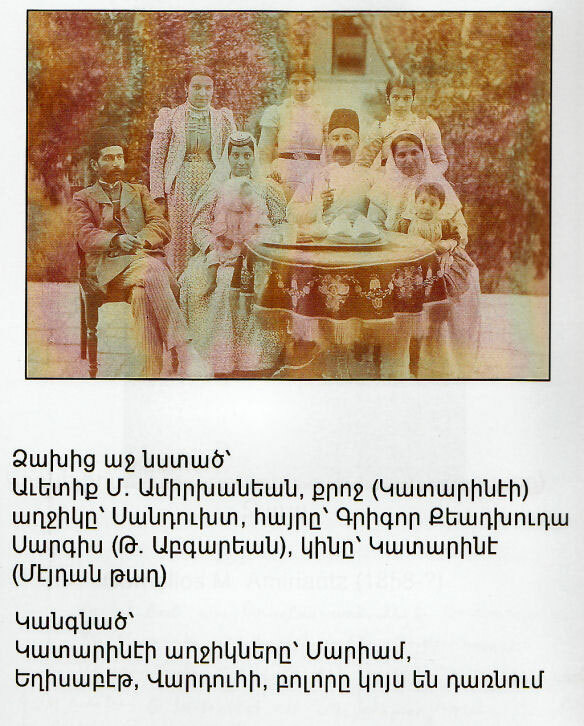 According the Family book, one of Amir's daughters was Peri (Marianna).Marianna married Gerigor Nahapetian at young age. Quote from the book: Amirkhan’s eldest daughter Peri (Mariana) married GrigorNahapetian. Nahapetian abandoned her wife when she was very young, and travelled to Java. He had three children from a temporary wife. Grigor deceived his wife Peri, after he took her to Java representing the officials that the children were theirs. After a short time, he compelled his wife to return to Julfa Esfahan. Despite his riches, his wife continued to live like a widow, whom he barely helped financially. Peri at lastperished in1881 without a child at the age of 57. Unquote. Following above mentioned informtion I started to check almanacs and other Dutch historical records and found the hereunder mentioned facts. Gerigor came to Batavia (Jakarta) somewhere around 1844 (according Dutch almanacs) and founded in 1847/1850 a business partnership with Mr. Zakara and forgot all about his wife Mariana whom he had left at New Julfa. Gerigor had a relationship with local Indonesian woman and had three children with this lady. For some unknown reasons Gerigor faced problems with the Dutch Administration regarding his residence permit and called his wife Marinanna from New Julfa to Java in order to convince the Dutch Administration that the 3 children were his and Marianna's which most probably succeeded as after a short while Gerigor snt Marianna back to New Julfa and left her the rest of her life alone.... Mariana was ashamed and about the way she was treated and lived her life in poverty declaring herself as a widow. She died at age of 57 years and most probably she was supported by the family members. Indeed, Gerigor did not treat his official wife Marianna in a decent way and not likewise a gentleman should act. Whatever happens (-ed) between man and wife in a marriage: A man - according my opinion - made a vow when he marries a wife and he always should accomplish his vow, otherwise he is not a man but simply a heartless beast following his own lusts. J. Gregory Nahapiet, M (Moses) Gregory Nahapiet, and A. Gregory Nahapiet. Moses married Henriette Martherus and both are buried at Tanah Abang graveyard, now Taman Prasasti Museum. E.M. and M. A. Nahapiet were cousins.... M.A. Nahapiet married 14 March 1888 at Surabaya with Celina Leonie Augusta Perret. (Died 19-7-1920 Malang) and E.M. Nahapiet married A.E. Thaddeus from Calcutta. I haven't found more information about the said persons above as in fact, they do not belong to my family members and therefore not relevant. I wrote this page of my blog only in respect of and for my aunty Marianna who had not been treated well by her husband Gerigor Nahapiet.